It is hard to stand out sometimes. There are seven billion people in the world, which means that even if you are a one in a million kind of guy there are seven THOUSAND people out there just like you. Even if you are a one in a billion kind of guy, your duplicates could form a boy band and leave you out. With so many people striving for all of the same things, getting what you’re after is tough. Fame? Fortune? Get in line, pal. The secret to achieving greatness, then, is to find your niche. As always, BrainLazy is here to show you where there are still plenty of opportunities. First up, super intelligent henchman. Think about it. The typical villainhenchman dynamic is intelligence with a muscle chaser. Obviously having a mastermind calling the shots makes a lot of sense, but it is that sort of inside-the-box thinking that has led to such an intellectual surplus at the top of the evil food chain. And let us not forget that those masterminds always get defeated, too. Hell, half the time they fail because they sent in an inept second in command to prep the shrink ray. Just imagine the sort of mayhem you could cause if you were sent in with a freeze ray and then, when the hero turns out to have his bat-longjohns on, what’s this? A heat ray of your own design?! Those heroes won’t see it coming. A word of advice, though. Just about every kind of ray has been done to death, so you might want to start making things in the grenade or rocket categories. Also, while you are seeking opportunities in the world of high crime, supervillains are always looking for a skilled helicopter pilot. Next, Monkey splicer. If you are a mad scientist but can’t stomach the thought of sidekickery, I suggest you try your hand at genetics. We’ve all heard of spider monkeys and squirrel monkeys, so clearly there is a market for genetically modified simians. The problem is that whoever has been mass producing these primate hybrids keeps crossing monkeys with other things that climb. Perhaps they were trying to produce some manner of hyper-climbing super-beast, but they have failed. Everyone knows the secret to success is to diversify. What would you rather buy, a combination analog digital clock, or a clock radio? So the key here is to find a way to augment an existing skill with a secondary one. Obviously bat monkeys and chameleon monkeys leap to mind, and I don’t think any of us can honestly say we haven’t daydreamed about a giraffe monkey. I think there is an even better option. My suggestion is a monkephant. Right away you’ve got the size bonus. Bigger is better. Not only that, but what do monkeys throw? Poo! And have you SEEN an elephant poop? A monkey’s aim and arm strength combined with an elephant’s digestive tract? That, my friends, is called synergy. No one within a hundred yards of the monkey cage at the zoo would be safe. Maybe evil isn’t your thing, or you didn’t pay enough attention in super science class back in junior high. No matter, I’ve still got you covered. Everyone has heard of horse racing, right? It is extremely popular, despite the fact that all we are talking about is a bunch of horses running in the circle. The market is wide open for the next logical step. 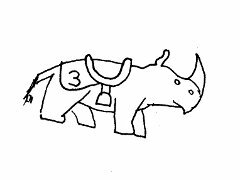 Rhino Racing. Not only is it a door wide open for a willing entrepreneur, but once it gets started all sorts of new opportunities present themselves. For one thing, no more skinny jockeys. If you put one of those little twerps on a rhinoceros the thing wouldn’t even notice. You’d need a retired lineman just to get its attention. And there are more benefits than putting a man’s man in the saddle for once. Preservationists are worried about the declining rhino population, but once you put those things on the racetrack, you better believe the greatest minds in breeding will be producing thoroughbreds in no time. In fact, if you want to save an endangered species, start racing them. We need panda jockeys before it’s too late! One last area that is a huge opportunity for those looking for a life of ease is the dining industry. Have you ever seen a sign advertising that a restaurant has “homemade pie” or the like? Well, I asked a cousin who is a chef, and she said that in the context of an eatery, homemade means made without any pre-prepared, processed ingredients. I’ve got to say, that sounds like a lot of work. Fortunately, semantics are our friend here. Technically, anything is homemade if it was constructed in someone’s place of residence, yes? That means that there is a huge, untapped market for “designated residents” for restaurants. They give you free room and board, and in exchange, everything that comes out of their kitchen can rightly be called homemade! That’s a great deal for all involved. They get food that sounds more wholesome, and you get a bedroom that smells like fried chicken all day and night. Where is the downside? I feel I’ve made it clear that there is no shortage of opportunities out there for the people willing to search for them. If you have the right skills, or the right motivations, the sky is the limit. No need to thank me, though if you succeed in making monkephants, keep me in mind. And if you follow any of my advice, drop me a line. I love to hear success stories. If gives me something to brag about to the people who say my ideas are “unrealistic” and “impossible” and “a clear indication of a severe neurological disorder impairing the patient’s ability to differentiate reality and fantasy.” And if you have any more opportunities you’d like to share, drop us a line! We’d love to here them. Now if you’ll excuse me, it is time for my pills.